Instantly engage students and captivate thier attention with hands-on interactive learning. Students and teachers can use a pen or their finger to interact with dynamic lesson activities and take control of the connected PC using the interactive whiteboard’s large, touch-enabled surface. Cost effective and powerful, the SB 480 offers dependable technology and exceptional value. The Smart Board 480 Interactive whiteboard is the entry level board from Smart Technologies and an impressive introduction to digital interactive learning. 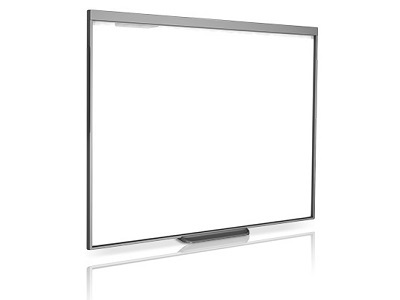 The 480 interactive whiteboard is intuitive to use with smooth natural touch control. All this combined with Smart software makes it easy for students and teachers to use enabling quick and successful integration into your lessons. Like all SMART Board interactive products the 480 is part of a comprehensive solution that includes support, professional development, classroom content and a community of peers, so teachers feel comfortable using the 480 and integrating it into their teaching. The combination of a whiteboard along with the extreme power of a computer the Smart Board 480 connects to a computer which is connected to a projector to display a teachers desktop on the interactive whiteboard. Teachers and students can then use and control applications from the PC on the interactive board you can even write notes in digital ink and save or share the work for later. The 480 also comes with SMART Notebook collaborative learning software, which helps teachers to create, deliver and manage high-impact interactive lesson activities. The key to the SMART Board 480 interactive whiteboard is touch. Teachers and students can write, erase, move objects and control applications using a finger or a pen. It is extremely intuitive to use with the 480, delivering dynamic lessons is easy.